When the artist moves into the classroom or community to educate and inspire students and audience members, this is Teaching Artistry. It is a proven means for practicing professional musicians to create a successful career in music, providing not only necessary income but deep and lasting satisfaction through engaging people in learning experiences about the arts. 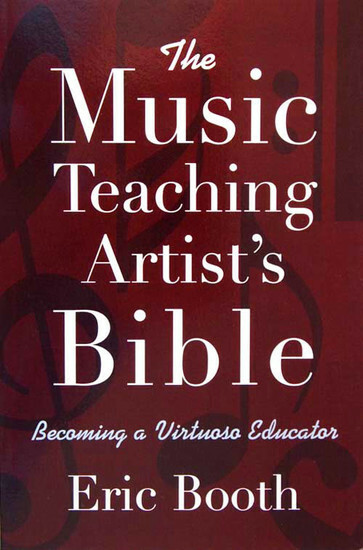 Filled with practical advice on the most critical issues facing the music teaching artist today--from economic and time-management issues of being a musician and teacher to communicating effectively with students--The Music Teaching Artist's Bible uncovers the essentials that every musician needs in order to thrive in this role. Author Eric Booth offers both inspiration and how-to, step-by-step guidance in this truly comprehensive manual that music teaching artists will turn to again and again. The book also includes critical information on becoming a mentor, succeeding in school environments, partnering with other teaching artists, advocating for music and arts education, and teaching private lessons. The Music Teaching Artist's Bible helps practicing and aspiring teaching artists gain the skills they need to build new audiences, improve the presence of music in schools, expand the possibilities of traditional and educational performances, and ultimately make their lives as an artists even more satisfying and fulfilling. 1. What is a Teaching Artist? 11. The Entry Point Question--Where to Begin? 13. What Does "Better" Look Like? 18. Art for Art's Sake or for the School's Sake? 24. Fuller Audience Engagement: What Does It Look Like?